This wood is very good to realise such reflexive works, simply use a centuries action of Nature. I am very glad for this ,energetic, material . Yep. Beautiful color. Nice forms. Don't know how to express what I find appealing about them. Typically I don't like things burnt and charred, mainly because the soot migrates to walls and hands and whatnot, but this looks nice. Is there any surface treatment or sealer? This oak was digged from bog.It's very old-this colours and shapes are natural.Sculptures are NOT burned-it's fossil. These are very fine pieces, Mieto. Thanks for joining the group and posting. I like how you have made that to look not as though you carved it, but as though it grew that way, or someone carved it centuries ago and the wood continued to grow and age over time. Very nice. Did you use some kind of oil to bring out the colour? beautiful. excellent balance of you versus the fossil. 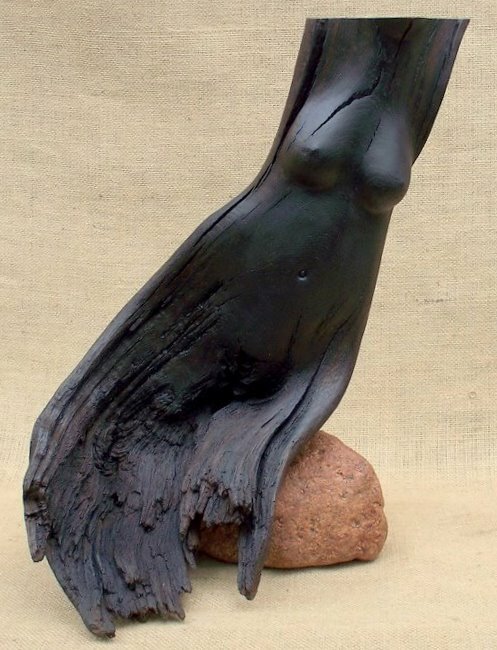 Yes, it's a beautiful piece indeed, as are all the other similar bog oak sculptures on your site. Your aesthetic sensibility with this type of wood is amazing. Have you tried sculpting other bog-wood as well?
. Thank you for the feedback I use the impregnation of beeswax and rosin. Like them very much. What are you carving these with? I guess Suburbanartists meant what kind of tools you use to carve these sculptures ??? Your work is lovely indeed. Standard: chain saw, rasps, steel brushes, chisels, sandpaper. Work is slower-more resistance of the material. Very nice! Again, you are able to make it look like that was what was always meant to be for that piece of wood. It goes beyond having a good idea and carving it out of wood. You have a consistent ability to tune into the heart of the wood. What an exciting material! Is it brittle, as at least some oak varieties are? Where do you get it? Let me second Glenn's comment, with emphasis. This is not an unusual genre, and a lot of the faces and breasts you find peeping out of twisty wood seem to me to be good work. But flirting around the edges frequently are such words as, forced, contrived, cutesy. These are so right that I just laughed in pleasure. Actually, I suspect the secret is that you had no hand in it at all---just plucked them out of the swamp where they grew naturally over millenia.